After comprehensive meetings across the region, and thinking over what helped my startup Reserveout get to its first close of our Series A US$4 million, I can honestly say that fundraising is one of the hardest and most time-intensive processes an entrepreneur will go through. Our raise, part of the first close of Series A, is led by regional venture capital firm Silicon Badia, with the participation of existing investors iMena Group, 500 Startups, and others. 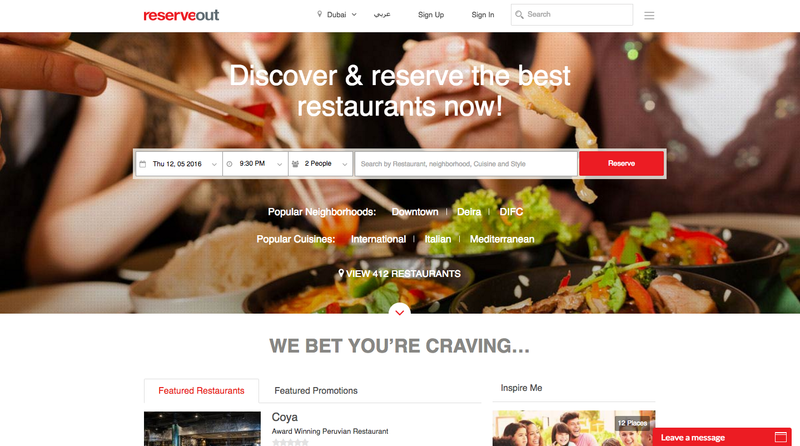 We plan on using the round to expand Reserveout’s presence with restaurants in the Middle East and beyond, and to grow our reach with consumers in the region centering in on our iOS and Android app offerings. We launched a revamped version of our website and our apps in December 2015, driving record reservations through the platform, which grew 120% year-on-year in 2015 and currently growing 25% month-on-month in 2016, with the majority of the growth coming through mobile apps. Among users of Reserveout’s Table Management System are the Hyatt and Rotana hotel chains across the Middle East. Establishing such partnerships is key in Reserveout’s growth strategy as that led to international growth for Reserveout in India; we’ve also begun working with restaurants in Shanghai, as part of the round’s proceeds is for expansion into growth markets beyond the Middle East. 1. Start early and plan well. You really need to start fundraising six to nine months before you need the funding, and in some cases, even earlier. It’s a lengthy process and sometimes the tiniest details can drag it on much longer than anticipated. Start with a long list of potential investors and break the list down into multiple categories of importance to you. You really don’t want to be sending information and answering questions to 20 different investors at the same time. Assess which ones are seriously interested and focus on them. 2. Set your own terms and stick to them (assuming you are being realistic ). Once you get a term sheet, that’s where the fun (and the headaches) begin, as investors will always want more rights and guarantees than you should give. They are going to negotiate on the valuation, even after the term sheet has been signed. Investors will often challenge your business plan and strategy and try to take you down a path that is not for you. You need to identify that quickly, and once again, stick to your terms and business plan. 3. Fundraising is a fulltime job. When you are fundraising, be prepared to have two full-time jobs and you need to be great at both of them- your business literally depends on it. You still have to manage and grow your company as you raise funds, yet you need to be readily available to present and update business plans, as well as produce more granular reports on the business and growth. No one will care if one is affecting the other. The business can’t suffer and the money needs to come in. 4. Investors want to know every little detail about your business. This includes everything from traction to marketing spend, and much more. They are becoming your partners, and they need to know the good, the bad, and the ugly. Start with a business plan, both short-term and longterm. They will want to know what your KPIs are, historical numbers and performance, growth strategy, product mix, what type of technologies you use, why your CAC is higher than the average, how do you retain customers, how do you keep them coming back, and the list goes on and on. They also want to understand your corporate governance and if you have good processes in place, what financial and accounting standards you use, what your hiring strategy is, how you retain top talent, how good the team is, especially at the top. Going through all of this data with a good investor is very eyeopening in many cases, so always keep an open mind. 5. Find investors that know your sector and industry. My biggest challenge this round was identifying the right investors for us. Our business model is different than the traditional online businesses, as we are both a B2B and B2C company, and our requirements and growth strategy are unique. We provide restaurants with a full reservation management platform that they use to run their business on, but additionally, we have our online channels enabling diners to book the best restaurants from their mobile or PC. We weren’t just looking for money; we needed both the money and investors who understand marketplaces, yet also the importance of the B2B component. I met with many investors, and in many cases, within the first few minutes, I found that they don’t have a clear understanding of our business model, and were already trying to change it. We are lucky to have a group of investors that understand our business model well, and share our passion for both having the best-in class reservation and table management systems for restaurants, and creating the best online restaurant reservations marketplace. 6. Have your answers to tough questions ready with a solid game plan. Many investors ask the question of how I have managed the business so far without co-founders, and at what point we’ll bring in more people at the top. I actually did have a co-founder early on, who was a brilliant developer and technologist- although Bashar Saleh and I remain very good friends, he took a different path a couple of years ago that was better for him. I’m currently in the process of recruiting senior management to lead the company with me, specifically a COO and a CMO, and I believe that having an action plan as a sole founder helped to inspire confidence in my enterprise. Investors want to put their funds into businesses that are built by great teams executing great ventures. Sometimes, you need to really drill deep into it to find out where there are exposure or vulnerabilities (if any), and how they can help you address the existing issues to strengthen the business model. You’ll need to prepare thoroughly, and the earlier you begin to compile the right material and build all-important relationships, the more ready you’ll be when the time comes to raise Series A for your startup.